Storms can cause serious damage to trees putting your property and neighboring properties at risk. After heavy storms there will be many storm felled trees that need removed and we will experience a higher amount of calls due to this. 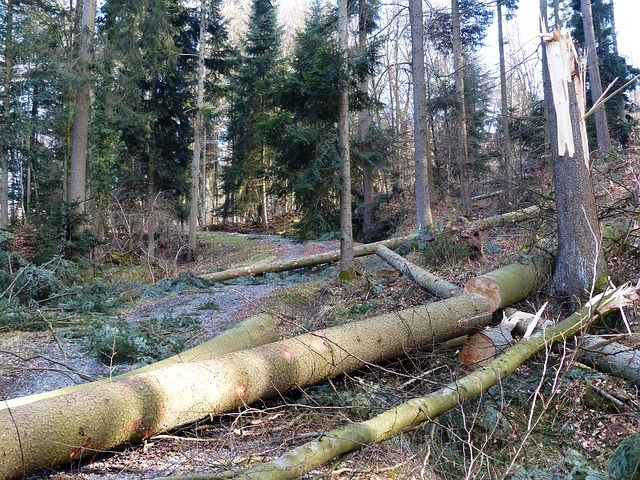 It is important that you let an expert remove storm damaged trees and branches as the removal of the damaged limbs or trees can cause further damage to your property. We have a capable fleet and will respond to your request as quickly as we can. the sooner you call the sooner we will come to your aid. Is it finally time to cut down on the over grown trees and brush around your property. We have the equipment to make tree and brush clearing a breeze saving you time and money. Free up the space around your property and turn those trees and brush into fire wood and wood chips so it can be useful to you again.